This last weekend the The Exchange Club of Newport Harbor hosted the 2012 Field Of Honor display at the Castaways Park in Newport Beach. The Exchange Club performs this feat annually to remember and honor those men and women who haved given so much to preserve the freedom of this country we enjoy. 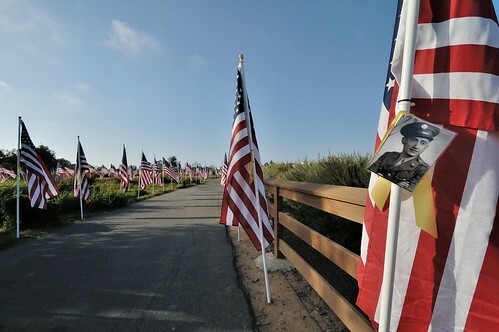 The display consisted of 1776 American flags positioned along the pathways of the park. Each flag carrying an inscription identifying the particular individual being remembered and honored by the donors who funded the flag installation. Further information about this event and the Exchange Club of Newport Harbor may be found here. I don’t know how a walk along these paths would affect you, but for me it seemed to move my focus a little further from me toward others, what they have done and are doing.